I am wearing the costume myself. The idea came from my love for unicorns. I saw some costumes last year that were just onesies you could buy in the store, zip up and wear and I thought to myself... I'm going to make my own unicorn outfit. Its always fun to be ethereal and magical, that you wouldn't normally get to dress as on any other day. I started with the unicorn horn, I used ribbon and foam paper and a headband. I rolled the foam paper into the horn shape and attached to headband by making small holes in foam, then I wrapped the ribbon all the way around. Next I looked up many ideas for ethereal makeup, I wanted the unicorn to be very magical and have lots of sparkles. 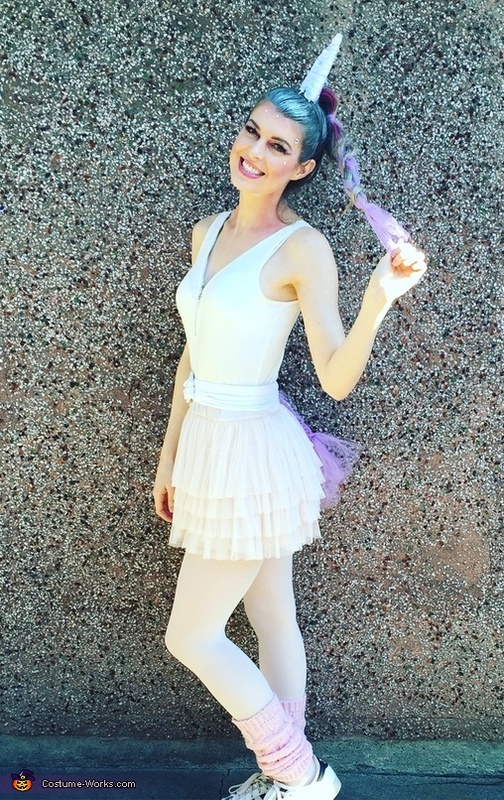 I then put together through my closet and my friends closets all white and pink materials to complete the costume including light pink leg warmers, a pink tutu, old ballet white tights, a white tank top I already owned and then I pieced together my tail my braiding ribbon. I then had the idea to add the ribbon also in my main aka my ponytail. And voila there you have it, a unicorn was born!